To make the BUNS: Preheat the oven to 325 degrees F.
Gently mix the protein powder and herbs into the whites. Grease a cookie sheet with coconut oil spray and place mounds of "dough" about the size of a hamburger bun onto the sheet. Let completely cool before cutting or the buns will fall. Assembly: Place 2 bun halves on each plate and top with ham. Poach eggs: Bring 1 in. water to boil in a 12-in.-wide pan. Lower heat so that small bubbles form on the bottom of the pan and break to the surface only occasionally. Crack eggs into water 1 at a time, holding shells close to the water's surface and letting eggs slide out gently. Poach eggs, in 2 batches to keep them from crowding, 3 to 4 minutes for soft-cooked. Lift eggs out with a slotted spoon, pat dry with a paper towel, and place 1 egg on each ham covered protein bun. 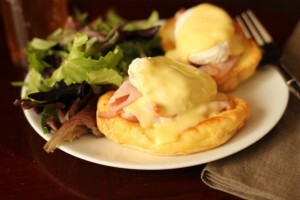 Top each egg with 2 to 3 TBS reserved hollandaise sauce and serve hot. POACHING EGGS TIP: add a few tablespoons of coconut vinegar to the simmering water you poach the eggs in. This helps hold the whites together.